The editors of SPIN have ranked the most influential releases since the magazine's 1985 beginnings - and Achtung Baby comes in at No.1. So what's so special about Achtung Baby ? Boy...did SPIN get this one right! I remember the day Achtung Baby came out. I skipped class in college so my roommate and I could go to the local mall and get U2's new CD. I had seen the video for The Fly and didn't quite know what to make of it. When we got back to our room and put the CD in, I was blown away from the first notes of Zoo Station to the last notes of Love Is Blindness. Every song was fantastic and needless to say, the CD hardly ever came out of the player most of the next two semesters. To this day, this is their best album, Zoo TV is the best tour I've ever seen and the opening combo of Zoo Station & The Fly is the best start to any of their shows. I was a U2 fan before this album but became an even bigger fan after. Much as Born to Run raised above the medicore of AOR of the mid-70's in came Achtung Baby with a swagger of seduction no opiate running a vein could ever deny admission, and the heady rush of new sounds resurrection remain as relative and fresh presently as the first distorted notes of Zoo Station assaulted the ears and consciousness breeding a renewed universe of U2 fans from that already loyal nation in place. We knew then U2 will never end. Fantastic choice, SPIN. This is the album that made me fall head over heels in love with the band. I remember hearing The Fly for the first time, I believe it was the first track released, on the radio in Chicago and the dj on WLUP was unsure what to make of it. I thought then it was the most beautiful noise I ever heard. It still stands as my favorite song and album and I even pay homage to to the album on my license plate. The ensuing Zoo TV tour, in my mind, stands as the greatest live rock show ever and set the standard for all megatours today. Achtung Baby Is just a great great piece of music. You cant say that theres any bad track on it , every song for its own has a message , which is great . Everysong sounds good live and not just on cd which makes it even better... BUT : WHY DONT YOU GUYS PLAY ACROBAT LIVE !? Probably one of the best songs ever written by U2 and one of bonos favourites so comon U2 - play acrobat live on the 3rd/4th Leg of the 360 Tour !!! I was 16 at the time, confused, didn't have any positive role models, listened to music like Michael Jackson, Madonna, Roxette and just what was on the radio ... And then it was Christmas 1994. I got a present from my sisters. I just looked at this casette with a half-naked-man on it, a snake, a man with heavy eye-liner - and just said: Thank you - you know like you're supposed to do - one of my sisters saw my confusion and asked: But don't you like U2? I had never heard of U2 before - and definitely didn't know whether I liked them or not - but I didn't want to be an ignorant, so I just nodded, smiled and said: Sure I do! And then I just put the cassette away on the table. I had this feeling that I'd never listen to this cassette again (so much for 6th senses - I mean, could I be more wrong?). So Christmas night (in many countries in Europe we celebrate Christmas Eve on the 24th) I listened to the tape on my old player. I was horrified. What was this sound? I quickly removed the tape, threw it in the back of my closet and forgot all about it. A few months went by - I found the tape again, and I listened to it once more. The sound was enormous, frigthening but also a bit intriguing - and then I listened to it again - it was strange. Something happened. A whole new colourful/dark/vivid/adventurous/deep world opened. It was a marvellous experience - almost-walking-from-the-closet-into-Narnia-experince. I was just totally blown away. I simply HAD to listen to the tape again. And again. It was almost addicting. I did not know who was in the band - and I did certainly not know how popular they were. I was just caught up in this wonderful music. 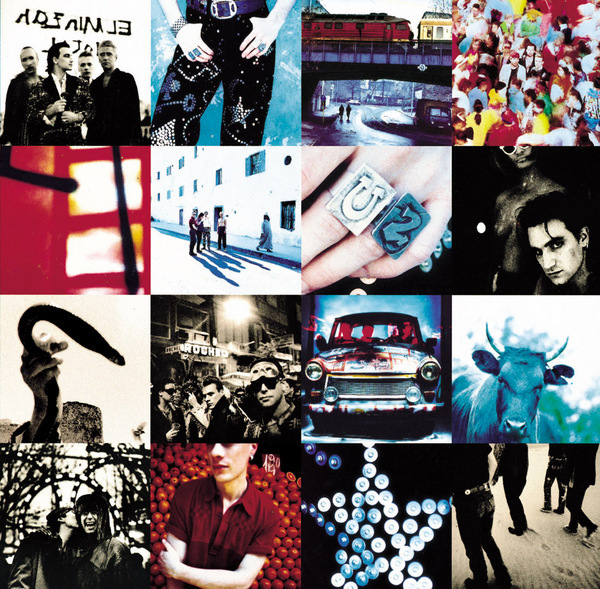 15 years on and Achtung Baby is still my favourite album - it did change my life. I discovered a whole new world, new big ideas (there were not many big ideas in my home town, I assure you) and just a whole new perspective on things. There certainly was a time before and a time after I heard Achtung Baby for the first time ... that album is a true miracle. The day this album came out is etched vividly in my brain. I remember jumping in the car, ripping open the tape, throwing it in and hearing Zoo Station and was like, can I return this to the store? What did U2 do to themselves!!! Then I listen to the whole album, over and over and over, I wore out 3 cassettes till I finally ponied up to by a CD player for my car. (After hearing hearing Zoo Station live really made me understand that it was always meant to be played live and I appreciated the song even more.) This album is what made U2 the greatest band ever. The reason is that the band changed and adapted and stayed relevant. Other "great bands" sound the same as their first album. U2, willing to throw it all away to find it again, showed how special they are to the music world. How many bands release an album 30 years after their first and hit number 1? If U2 had not made Achtung Baby, but instead made Joshua Tree Part 2, they would be doing reunion tours, not setting records selling-out concerts. And what is amazing, this album still works today - Mysterious Ways - amazing; The Fly, Acrobat - pure joy; One - timeless. I was really glad when they decided to play Ultraviolet on this last tour - never could understand why this was not released as a single on the radio. And as for the rest of the 90's albums, Zooropa and Pop do not get the credit they deserve - they are a part of the U2 journey and one I hope lasts decades to come. I know many say, Joshua Tree, Joshua Tree, greatest album ever... But for me, knowing the history of how this album came to be and the timelessness of the songs, Achtung Baby is the album all of their work should be compared to, it is what changed the band to be the band that is today, U2. I listened to Achtung Baby all through art school, it helped me get into a creative mood with a lot of my paintings. This have been my favorite U2 album since I was a teenager... I played the CD for so long that I had to get another one since it broke :S This album is a great transition from the 80's to the early 90's music. LOVE IT!!! Glad the band plays the songs from this album on tours.... LOOOOOOOOVE IT!! One says it all :) Glad you Irish stuck in the moment as One! I was in Berlin 2 weeks ago and the soundtrak in my mind was all Achtung Baby, specially Zoo Station , everytime i have to get a metro there.Its an amazing album. My First U2 Concert the Actung Baby has a beat and songs that just arrive's Like the So Cruel and Never forget the The Fly and The End of the world are the my best song's of the Early 90's after High School the best Album in the U2 Collection. See you this Summer the U2concert in Oakland ,Ca " Never Trust a Man with Shades"
Sometimes I feel like checking out.....zoo tv tour, the show opener Zoo station, and esp Ultraviolet still give me chills. Sorry to say that the album and tour haven't been equalled again but NLOTH is great and hopefully the boys will springboard back towards zooropa and POP (THE MOST UNDERRated album.......brilliant..) If i never hear vertigo, elevation, beautiful day again live, i won't shed a tear...HOw about arm's around the world, wild horses and SO CRUEL! Mothers of the disappeared....one tree hill...stop me. U2s best album by far. Bono always spoke of Rock 'n' Roll before this album but that's not really U2. This is Rock - an amazing album and the Zoo TV Tour, the greatest show I have ever seen. They've tried since but the live shows since 2001 just haven't had the sheer 'power' AB brought. Zoo Station, U/violet and End of the World - a different class. I'd like to think it's not the money father ted but asking us to subscribe a year in advance and then not coming back to the UK says a lot. Now I know what Lemon was about! I remember watching the Zoo Tv spectacle as it rolled into Landsdowne Road,Dublin,late August 1993. Even though the album release had been some relatively considerable time before,the dust hadn't settled at all on the Achtung Baby release,and the tracks were buzzing still.U2 had probably a saturation high point at that time,nevermind sattelite television,they were hittng terrestial television in UK/Ireland during that period just about as much as any band could - a great plus for U2 fans at the time! 'Trying to throw your arms around the world',one of my favourites,a fabulously subtle track,epitomised the band at that time for me...and 'ONE',timeless and still poinant today as I listened to 2FM radio in Dublin reflect on the sudden death of one of thier presenters and long time U2 fan & friend Gerry Ryan. 20 years on and still dreamin out loud.Fantastic. Bono keeps emphazising the lyric in "One" is:..we GET to carry each other... doesn't he? It should point out the possibilities in it, it's not a "must". It makes me sad that they don't play this song live. could have gone my whole life listening to music, because of this album now i dissect everything i hear. brilliant piece of work.